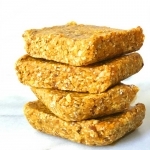 Naturally sweetened with dried mangoes and dates, these soft and delicious mango chia energy bars make the perfect pick-me-up snack. Only 6 main ingredients! Line a 9×5 loaf pan with parchment paper, with the excess paper overlapping the longer edges of the pan. In a food processor, add the dates, mango, chia seeds, salt, and process until the ingredients are chopped up finely and sticking together in a large mass. Scrape down the sides if needed and then add the remaining ingredients: almonds, oats and melted coconut oil. Process until thoroughly combined or until the mixture appears chewy yet consistent in texture. Transfer the mixture to the lined loaf pan and fold down one side of the parchment paper over the mixture before firmly pressing down. The more you press, the better it will hold! Refrigerate for 45 to 60 minutes before slicing into bars. Refrigerate leftovers in an airtight container for 4-5 days.